Happy Birthday, Voyager 1! Far-flung Spacecraft Is 36, But Has It Left the Solar System? 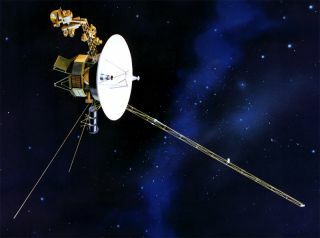 Scientists debating whether or not NASA's Voyager 1 spacecraft has already left the solar system can come together today to celebrate an uncontroversial milestone — the venerable probe's 36th birthday. Voyager 1 blasted off on Sept. 5, 1977, about two weeks after its twin, Voyager 2. The two probes conducted an unprecedented "grand tour" of Saturn, Jupiter, Uranus and Neptune, giving researchers some of their first good looks at these big outer planets and their moons. Then the Voyagers kept on flying, streaking toward interstellar space. That finding is based on a new model of the solar system's outer reaches. Voyager mission scientists have used a different model to conclude that the probe is probably still within the sun's sphere of influence, plying a mysterious transition region at the edge of interstellar space. Conditions are certainly strange in Voyager 1's neck of the cosmic woods. The spacecraft has detected a big drop in solar particles and a simultaneous jump in high-energy galactic cosmic rays, which originate outside the solar system. But Voyager 1 has yet to measure a shift in the ambient magnetic field, which mission scientists expect to observe when the probe finally pops free. Still, mission chief scientist Ed Stone, of the California Institute of Technology in Pasadena, said he and his colleagues will keep the new model in mind as they continue to analyze the data that Voyager 1 beams home from its exotic locale. "The Voyager 1 spacecraft is exploring a region no spacecraft has ever been to before," Stone said in a NASA statement released shortly after the new paper was published last month. "We will continue to look for any further developments over the coming months and years as Voyager explores an uncharted frontier." Though Voyager 1 is old, it should be able to keep traveling for a while longer, provided nothing too important breaks down. The probe's declining power supply won't force engineers to shut off the first instrument until 2020, mission scientists have said. All of Voyager 1's science gear will probably stop working by 2025.